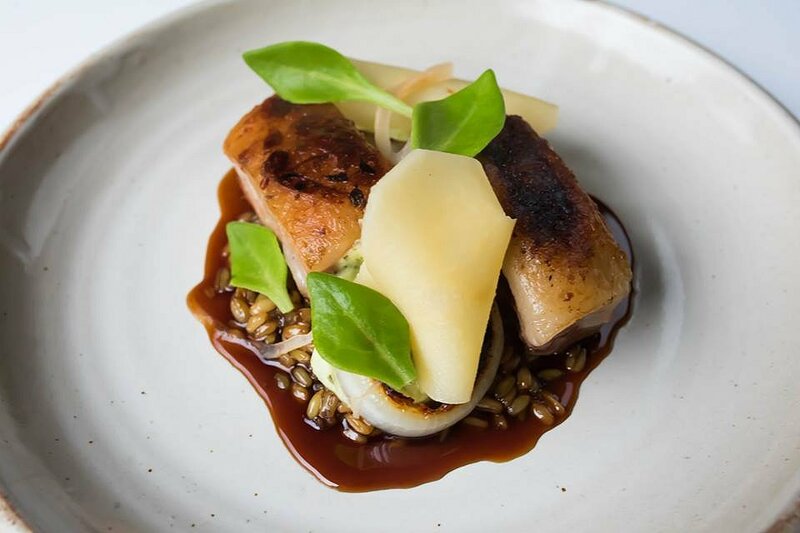 Nestled within the Adelaide Botanic Gardens is the appropriately named Botanic Gardens Restaurant. The kitchen is run by acclaimed Head Chef Paul Baker who has developed a distinctly modern Australian menu. 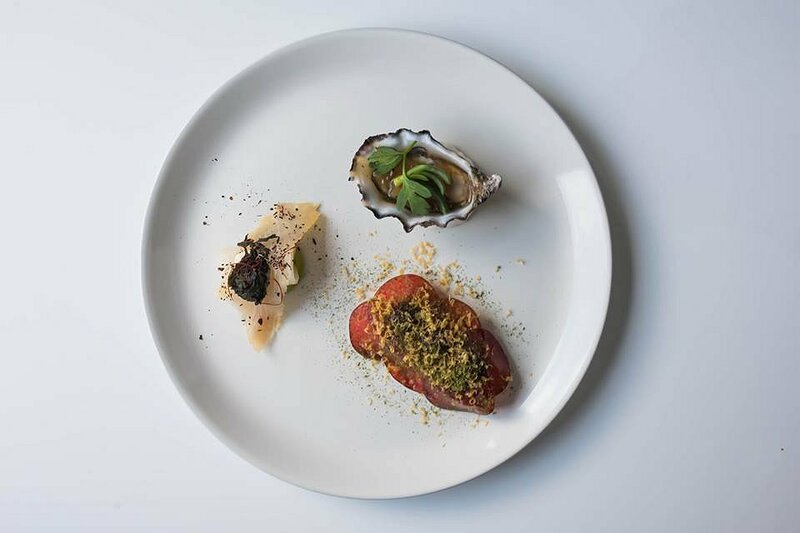 Chef Baker has a “kitchen garden to restaurant table” mentality and minimises the food miles by using ethically farmed South Australian produce, and fresh vegetables and herbs harvested from the nearby Botanic Gardens kitchen garden. As with every other year, the Botanic Gardens Restaurant is participating in this year’s Festival of Food. We were fortunate enough to sample all of the dishes and we left the restaurant more than impressed. We started off with the Salad of Salanova with pecorino, pear and walnut dressing. 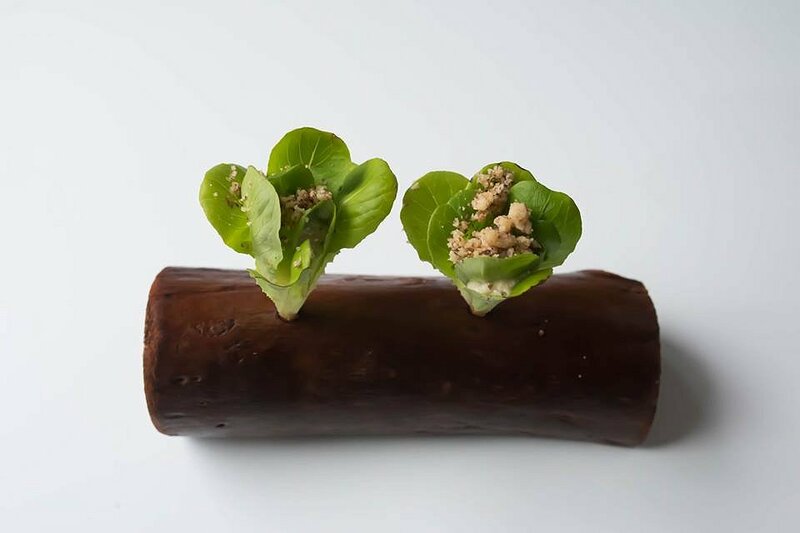 The presentation was unique with a specially designed log purposely built for this dish. The sharp taste of the pecorino was dominant and matched perfectly with the fresh, crisp lettuce leaves. Festival of Food diners will all experience the Entree Tasting Plate. On the top was the Coffin Bay Oyster with charred cucumber and bonito. The fresh oyster had a silky smooth texture with flavours of the ocean well complimented by the bonito. At the bottom was the Pork Head Terrine with damson plum, cured egg yolk, dwarf mulberries and loveage powder. The terrine was firm and gelatinous with a lovely natural sweetness coming from the plum and mulberries. To the left was the Cold Smoked Kingfish with daikon, salted perilla and yuzu puree. This dish was well balanced with the smokiness of the kingfish, the zest in the yuzu and the saltiness in the perilla all working together in harmony. 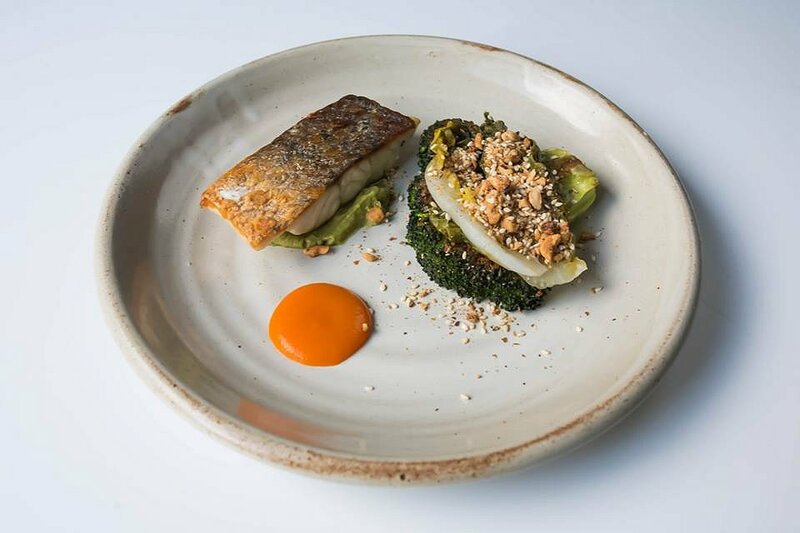 The mains begin with the Wild Caught Mulloway with fermented cumquat, broccoli and pickled lettuce. The fish fillet had lovely crispy skin while the flesh was soft and delicate. It worked amazing well with the bright orange fermented cumquat that was sweet and pleasant in taste. The broccoli tasted like it had been roasted, while the pickled lettuce added some sour notes to the plate. 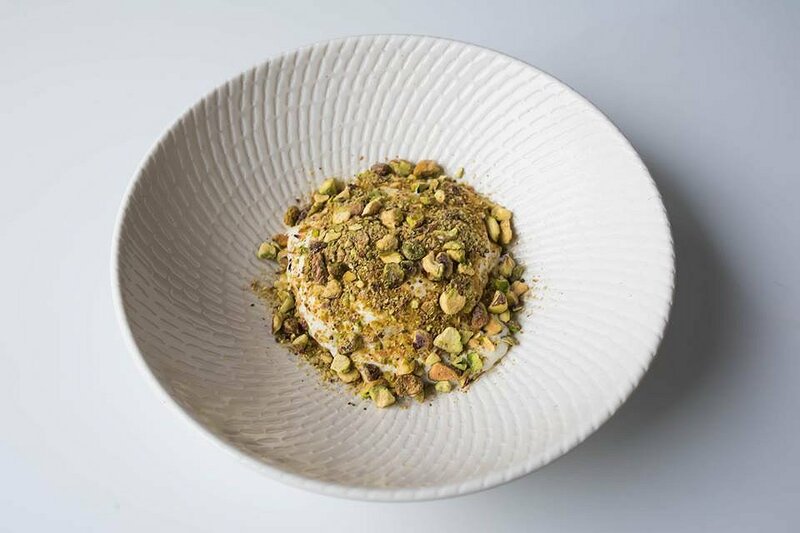 The topping of nuts and dukkah brought earthiness and a crunchy element to the dish. 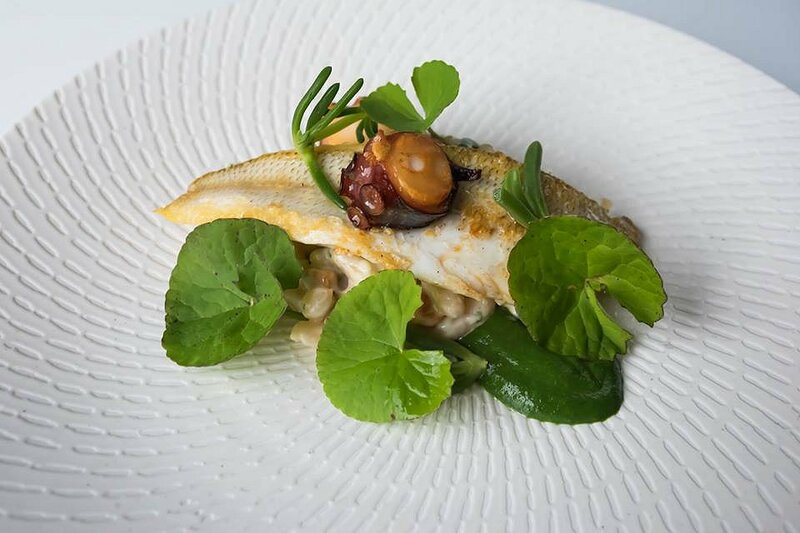 The Whiting with caramelised octopus, white beans, fish emulsion and centella was one of the most well presented dishes of the day. Again the skin of the fish was crisp, while the flesh was soft and delicate. 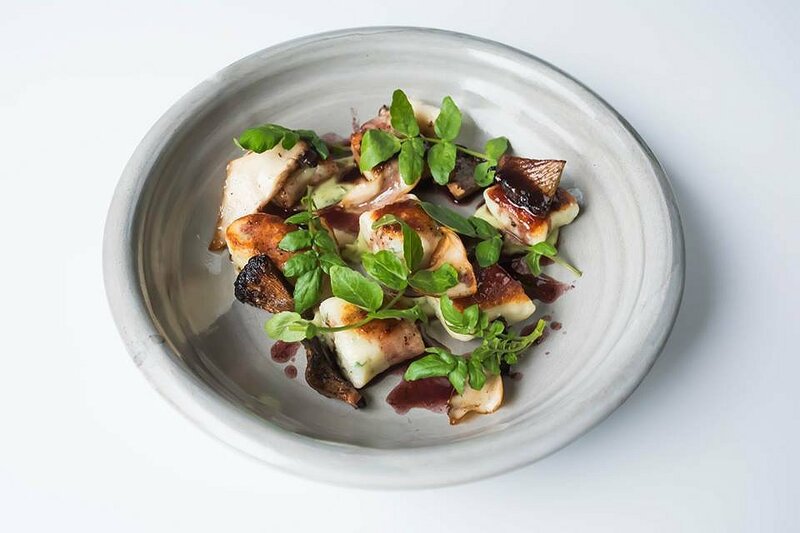 The caramelised octopus was firm and chewy, and added good contrast to the dish. The whiting and the octopus sat on a bed of white beans which were firm and covered in fish emulsion. One of our favourites was the Ricotta Gnocchi with mushrooms, red cabbage and wild watercress. The gnocchi were consistent in size, and their texture was soft and pillowy. The mushrooms were full of flavour and brought out the earthiness in the dish. The watercress added a crispy component and created textural contrast. Who doesn’t love pork belly? 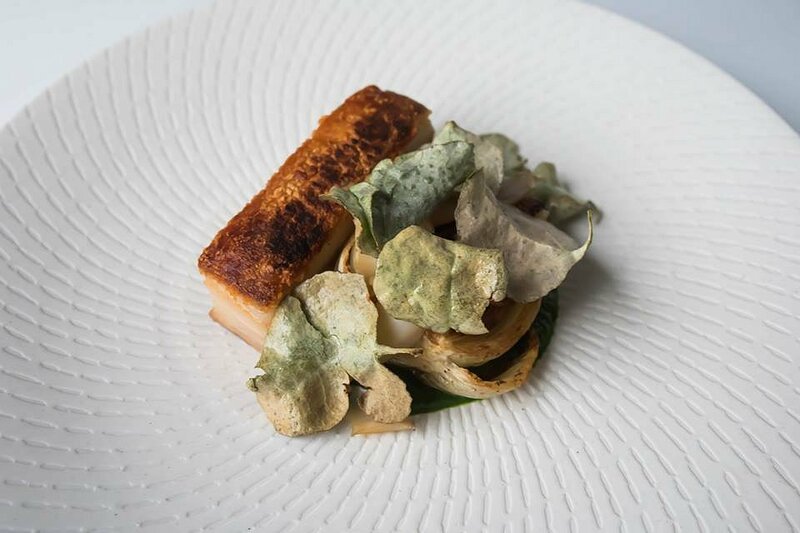 On the menu today was the ShuAm Pork Belly with abalone, warrigal greens and crispy saltbush. The skin of the pork belly had perfect crackling, and the meat, although a bit fatty, melted in your mouth like butter. The pricey abalone was thinly sliced, firm, and not too rubbery. This was all well complimented by the warrigal greens puree and crispy saltbush. As a first, we tried the Lamb Neck with freekah, onion caramel, parsley cream, quince and barilla. The skin of the neck was nicely charred until crisp, and the meat was juicy and succulent. If you don’t like the sight of layered fat, just simply close your eyes and enjoy the taste. The lamb was sitting on a bed of freekah which was soft but firm, and soaked in the natural sweetness of the onion caramel. The thin slices of quince had a lovely natural sweetness while the parsley cream was soft and delicate. As we always say, no meal is complete without dessert. Don’t expect small bite size sweets here, but a normal sized dessert. On offer today was the Orange Blossom Parfait with yoghurt, dates and pistachios. Underneath the bed of crunchy pistachios is a smooth and delicate parfait. The dessert is not overly sweet and the perfect way to end a meal. Festival of Food 2017 is available at Botanic Gardens Restaurant from Tuesday to Friday lunch for $42.50, Friday dinner for $52.50 and Saturday lunch for $52.50. The Festival of Food meal can be upgraded to the Tasting Menu for $75 per person. Look out for the Festival of Food pamphlet in your letterbox or simply download the app to take advantage of this and other offers.